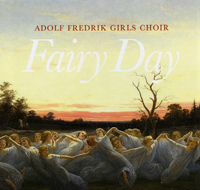 The conductor of the Adolf Fredrik Girls Choir is Fredrik Winberg. He majored in singing and conducting at the Royal College of Music in Stockholm 1996-2002, the final result of which was a post-graduate diploma in choral conducting. Since then he has worked mainly as a conductor with his own ensembles Västerås Chamber Choir and The National Pro Musica Choir, as well as shorter or longer projects with the Swedish National Youth Choir, the Swedish Radio Choir, Norrlandsoperan, SAMI Sinfonietta, Marinens Musikkår, Järfälla Symfoniorkester to name a few. He also works as a solo and ensemble singer, for example with the Eric Ericson Chamber Choir. He was a founding member of Voces Nordicae, nowadays VoNo Vocals. Fredrik Winberg was employed as a music teacher at Adolf Fredriks musikklasser right after his graduation in 2002. Apart from his teaching work there, he also teaches choir and conducting at the College of Music in Örebro. The choir was founded in 1972 by teacher and conductor Bo Johansson, who led the choir for almost forty years, giving his final performance with the current choir as well as over 300 gathered former Girls Choir singers, many of them now professional musicians, at a gala concert in Stockholm January 22nd, 2011. Mr. Johansson - or to his friends, which tended to mean most of the people who ever met him - "Bosse", passed away at the age of 72, May 10th 2016. This is a link to a short obituary by one of his long time friends, Christan Ljunggren. Click here. Karin Bäckström took leadership of the Girls Choir after Mr. Johansson in 2011. Karin graduated as a church musician from the Royal College of Music in Stockholm. Before moving on to the school of Adolf Fredrik, she was employed as a church musician in the Adolf Fredrik Church in Stockholm, where she was the conductor of the Adolf Fredrik Church's Youth Choir. Karin worked with the choir up until the summer of 2016. During the 2016/2017 season the choir was led by conductor Sofia Ågren. Born in 1985, Sofia studied choral and orchestral conducting at the Royal College of Music in Stockholm, Sweden, and also has a Master of Education in music (with choir conducting and classical singing as main subjects). As a part of her studies she has worked with professional ensemble singers and with ensembles such as the swedish Radio Choir and Eric Ericson Chamber Choir. Previously Sofia has studied music science, choir conducting, and music theory at both Uppsala and Stockholm universities. She is currently working as a teacher of choral singing at the Stockholm Musikgymnasium. She is also the conductor of Uppsala Vokalensemble and project leader of "Levande Körmusik", a national plattform for contemporary choir music, composers and conductors.